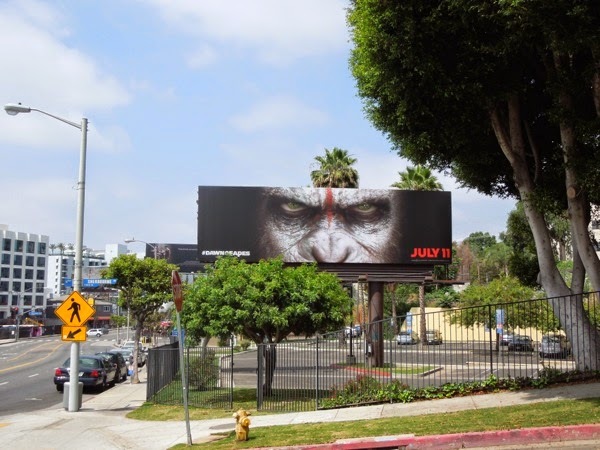 Now this is how you tease a movie sequel. 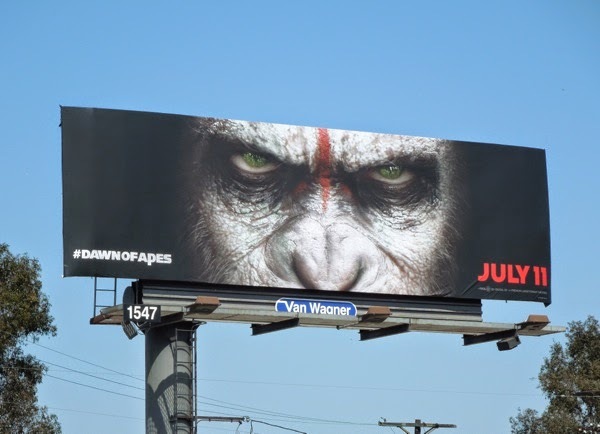 These billboards for the Dawn of the Planet of the Apes featuring the genetically enhanced chimpanzee Caesar's face are intense and captivating. 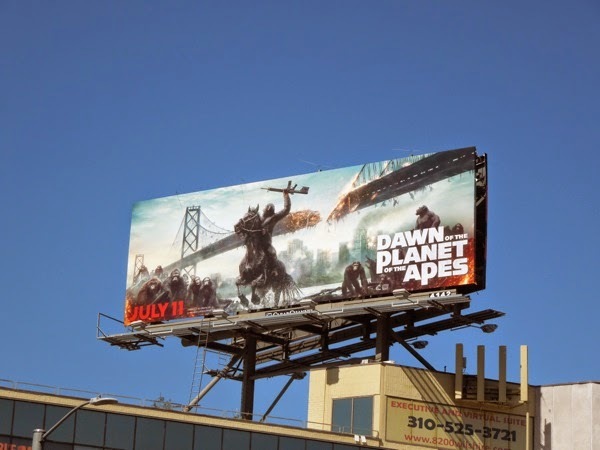 In the follow-up to the 2011 reboot of the Planet of the Apes film franchise, Rise of the Planet of the Apes, 'Caesar' (played by the wonders of motion-capture magic by Andy Serkis) and his growing nation of chimps, gorillas and orangutans come head-to-head with the survivors of the pandemic plague that wiped out most of humanity. 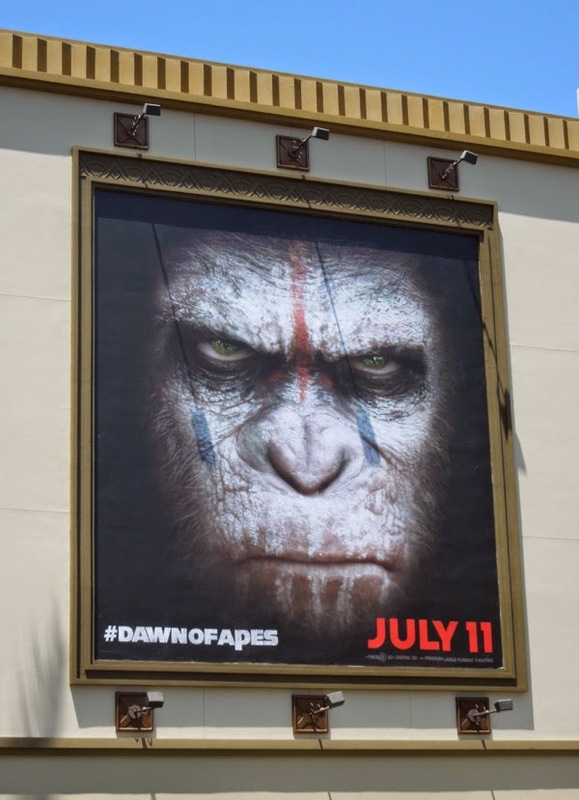 Gary Oldman, Keri Russell and Jason Clarke are just some of the humans that ape tribe will face to see who is the dominant species remaining on Earth. 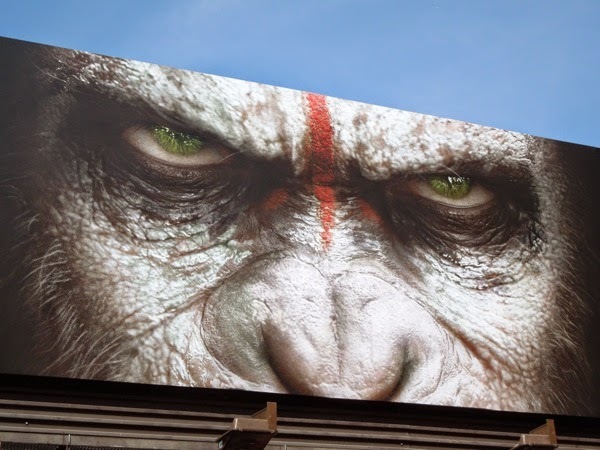 These mesmerising billboards were spied along L.A.'s Sunset Strip and Venice Boulevard on May 24, 2014 and Daily Billboard wonders if we'll see more ad creatives before the film is released in July. 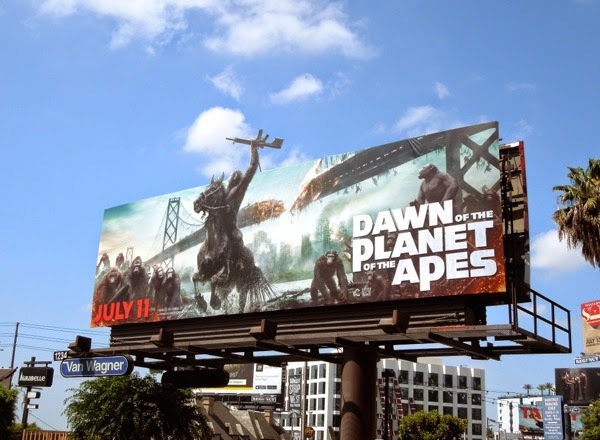 Interestingly Daily Billboard didn't spy any outdoor billboards for the 2011 movie, so it's nice to see this sequel taking to the skies of L.A. in such a creative way. 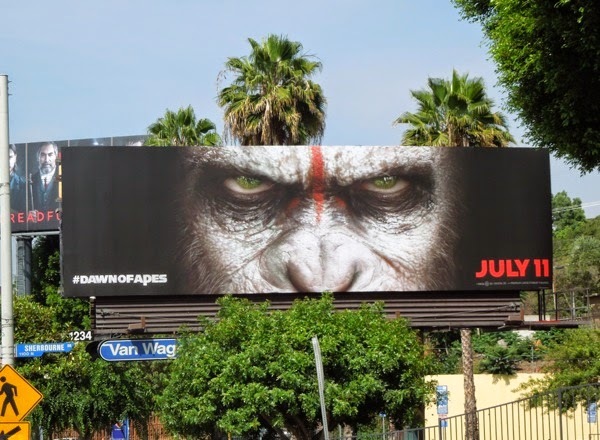 UPDATED: Here's a full chimp face billboard version for the movie, showing more of Caeser's primitive tribal markings. 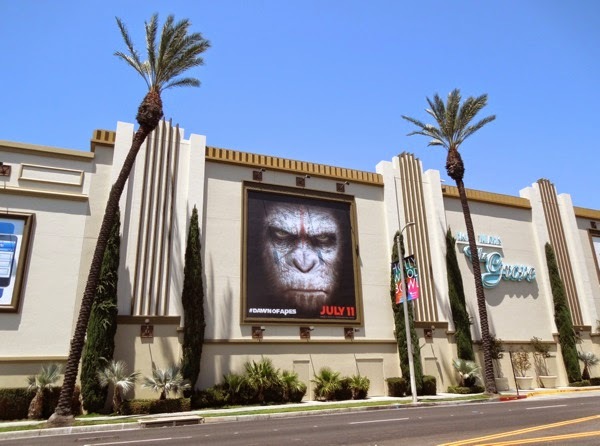 This portrait ad creative was spotted along 3rd Street on the side of The Grove shopping centre on June 12, 2014. Both versions are quite arresting visuals, but focusing on the eyes certainly gives the image more intensity. 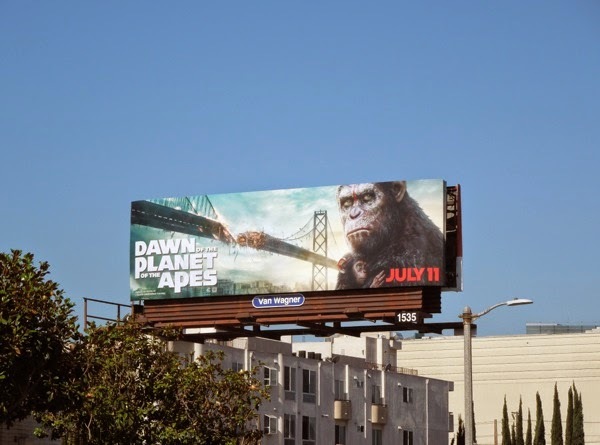 UPDATED: You knew it was going to happen, and this follow-up to the Dawn of the Planet of the Apes teaser doesn't disappoint. 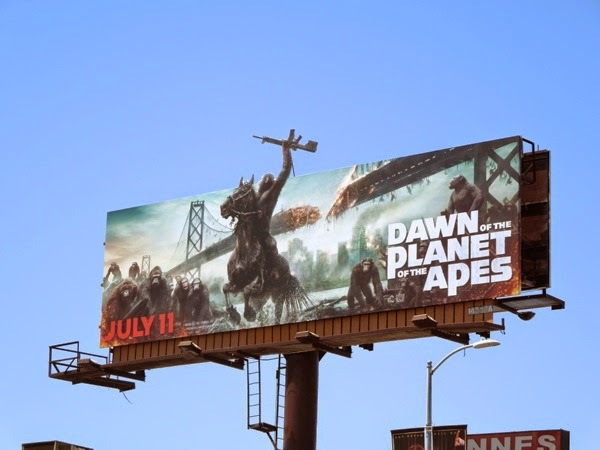 This creative of Caesar riding horseback with gun held aloft looking like he's starting a revolution, really evokes the iconic imagery of the original Apes movies, with their menacing horse-riding militaristic gorillas. 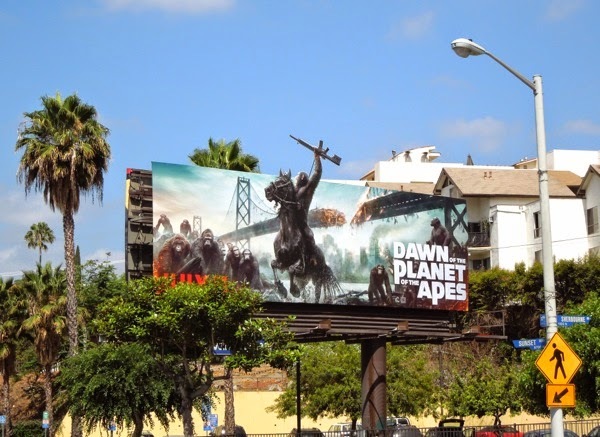 This fantastic special extension billboard was snapped along Sunset Boulevard on June 16, 2014, and there's something about it which reminds Daily Billboard of the Transformers: Age of Extinction billboard with Optimus Prime wielding his sword sitting astride Grimlock the Dinobot. 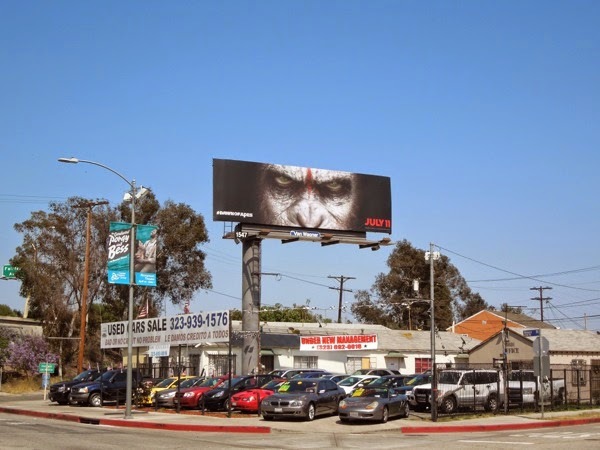 Plus here's another example of the eye-catching movie sequel billboard spied the next day along La Cienega Boulevard. 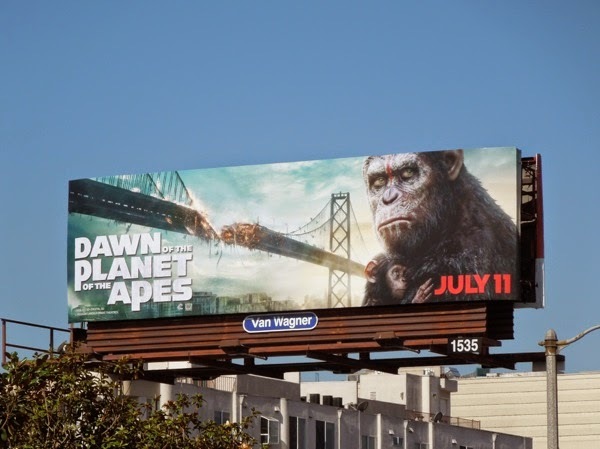 In addition, here's another creative with Caesar as a dad to a baby chimp with the destroyed Golden Gate Bridge in the ruins of San Francisco behind them. 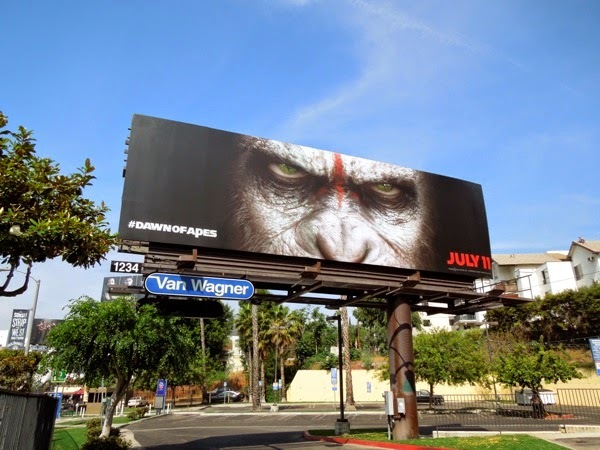 This familial ape billboard was spotted along Beverly Boulevard on June 19, 2014. 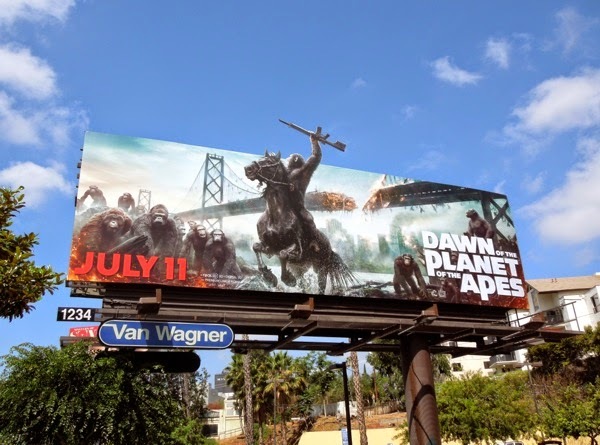 UPDATED: Plus here's a standard version of the horseback creative spied high over Wilshire Boulevard on July 11, 2014.